Co-organized by the Ministry of Foreign Affairs of Japan, Japan Disability Forum, Nippon Foundation, Tohoku University, UNESCAP, United Nations University International Institute for Global Health, World Bank Group. On 15 March, the UN-DESA/DSPD Public Forum: “Taking action toward a disability-inclusive disaster risk reduction framework and its implementation” will be organized by the Secretariat for the Convention on the Rights of Persons with Disabilities of the Division for Social Policy and Development of DESA*, in collaboration with DESA’s global partners. 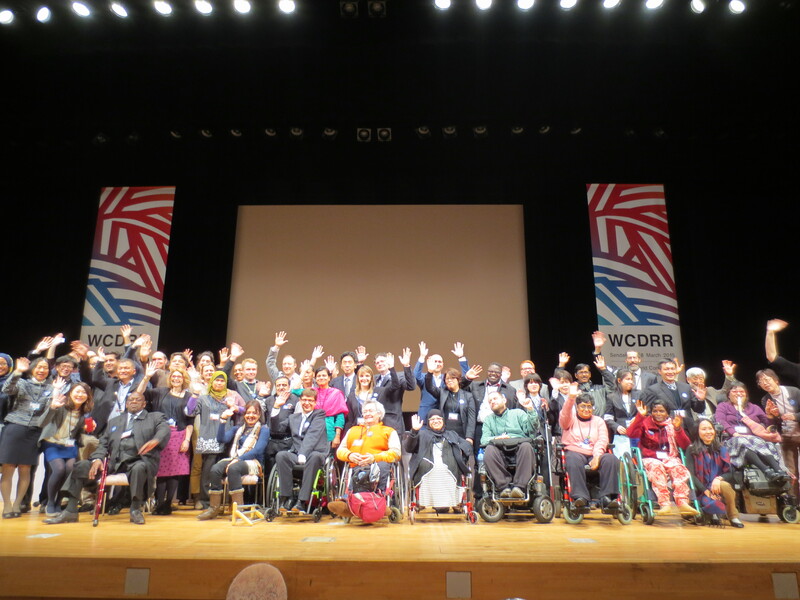 The Public Forum will discuss and document concrete recommendations toward disability-inclusive disaster risk reduction (DiDRR) as a contribution to the Third World Conference on Disaster Risk Reduction, its outcome and future implementation of the Hyogo Framework of Action II (HFA2) as an integral part of a post-2015 development agenda. The Forum will also do the stocktaking, review and assessment of the effectiveness of existing DRR policies and programmes, as well as the progress made and lessons learned for the advancement of DiDRR at local, national, regional and international levels. The Opening segment will discuss the status of DiDRR in the context of the on-going work toward a post-2015 development framework. It will include an overview of the DiDRR framework and its progress, challenges and obstacles in disability-inclusion in disaster risk reduction, resilience and reconstruction at both policy and programme levels. This session will consist of sharing experiences and lessons learned on the ground to advance DiDRR, in particular, the experience of the 2011 Great Tohoku Earthquake and Tsunami and DiDRR. This Session will be led by the Japan Disability Forum, in collaboration with DESA/DSPD and followed by an interactive discussion. This segment will discuss how to successfully advance DiDRR policies and their implementation in the global, regional, national and local contexts. The discussion will include good practices in removal of physical, social and cultural barriers to DiDRR as well as “emerging DiDRR issues”, such as mental health and mental well-being, social groups with increased vulnerabilities and promotion of the use of DiDRR technologies. This segment will focus on “next steps” in preparation for the implementation of the HFA II. It will examine the role of governments, the UN system, organizations of persons with disabilities and other disability and civil society organizations, expert/academic communities, private foundations as well as the private sector and how they can go beyond “boundaries” to achieve the goal of disability-inclusion in disaster risk reduction, resilience and reconstruction. The discussion will also explore and take stock of ways and means to strengthen global/regional/national and local networks and build new partnerships for concrete results in implementing DiDRR. The session will include a presentation of summaries of the preceding sessions as well as the recommendations for next steps to implement DiDRR in global, national, regional and local contexts. All participants in the Forum are encouraged to share their experience, expertise and new ideas at the Forum the following questions and to contribute their vision for future DiDRR as an integral part of the emerging post 2015 development framework. What are good practices that have successfully overcome the obstacles/challenges encountered in disability-inclusion in disaster risk reduction (DiDRR)? How and why were they successful? What specific Disaster Risk Reduction (DRR) policies have worked in including the disability perspective and in engaging persons with disabilities in the mainstream DRR efforts? From the disability perspective, what are the priorities for the DiDRR? Who can do what in making these priorities an integral part of the priorities of the mainstream DRR policies, programmes, guidelines and practice (Governments, UN, organizations of persons with disabilities, CSOs, development agencies and other stakeholders) in order to effectively implement and monitor the HFA2 at both national and international levels? How multi-stakeholder partnerships could fast track the implementation of disability-inclusive HFA2 at the global, national and local levels? What are good practices? How do we build effective multi-stakeholder networks and partnerships toward a global DiDRR movement to strengthen the overall disaster-risk reduction, resilience and reconstruction? English will be the working language. English-Japanese simultaneous interpretation, real time closed caption (CART) services will be arranged, and sign language interpretation will also be arranged subject to actual requirements. Those who may require special assistance for their participation are requested to get in touch with the host at least two weeks in advance. Further information available at the UN Enable website www.un.org/disabilities or contact the Secretariat for the Convention on the Rights of Persons with Disabilities, United Nations via email: enable@un.org. Kindly click the below website link and find the exact location of the Forum venue, located in Tohoku University, Building B, Classroom B200, which is marked 9 on the map. http://www.tohoku.ac.jp/english/profile/campus/01/kawauchi/map_kawauchi.pdf. * The Public Forum is an initiative of the Secretariat for the Convention on the Rights of Persons with Disabilities of the Division for Social Policy and Development, Department of Economic and Social Affairs (UNDESA). Officially launched in 2013, the Forum on Disability and Development aims to contribute to the on-going work toward an inclusive, accessible and sustainable post-2015 development framework through exchange of experiences, expertise and new ideas to develop practical solutions for pressing issues with regard to disability-inclusion in development.